There is only one overnight sleeper train from Qingdao to Beijing and it seemed impossible for us to get tickets for it. There are however tons of the more expensive super fast trains between the two cities, that have been introduced ahead of the Olympics to get people to the sailing events on the coast. The trains are luxurious with giant reclining chairs, lots of leg room and a complimentary bottle of Tibet Spring water (the expensive brand). It took us less than six hours to get to Beijing. 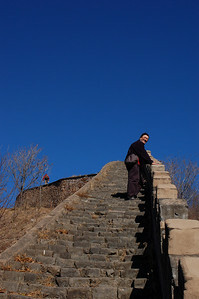 From there we had to catch a bus to Chengde, a city about 4 hours north of the capital. It took us a long time to get to the bus station, thanks to the taxi driver who decided to drive us around town for a few more yuan. When we got to the station I had already pulled out the map and started discussing with Yann and my dad about the ridiculous route we had taken (while pointing at the meter) the driver became visibly nervous, and ended up giving us a discount off the price of the meter (which has never ever happened to us and wasn't expected). We still probably paid too much. We had just missed a bus to Chengde and were forced to wait a few hours for the next one, which was cheaper, so most likely slower. When traveling by bus, Yann always insists that we don't sit in the front seats, to prevent us from flying through the windshield. This time, for some reason, we chose the two front seats (my dad one row back), which evidently cursed us into getting China's most lunatic driver. If it wasn't the accelerating out of the bus station over the six consecutive speed bumps that signaled trouble, it had to be barreling onto the busy highway in the wrong direction down an offramp. The next four hours are a blur of oncoming headlights, swerving, honking, smoking, and gravel road detours. Thankfully, the driver had an able copilot warning him when he was about to hit a cyclist or ram into a truck backing out onto the highway without any lights on (and of course without checking for oncoming traffic). Most of the trip was made in the dark, which added to insanity of the situation. We knew we wouldn't be taking the express toll highway from Beijing, as we had the cheap tickets, but the alternate route included driving over ditches on temporary mud bridges. Sometimes we would be drive along a side road parallel to the expressway, which we gazed at longingly. Yann cursed my seat choice the entire trip and my dad seemed to be in a state of shock. Being late October the temperatures were hovering around zero Celsius and low season prices were in effect at the lovely Mountain Villa, a hotel with chandeliers, revolving doors and bellhops. 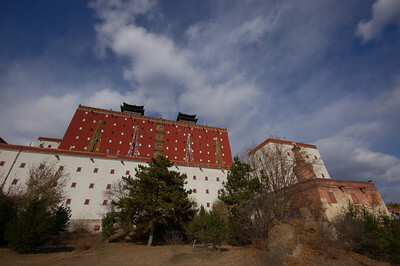 Right across from our hotel was the Mountain Resort, the summer palace and hunting grounds of the Manchurian Emperors. Around the walled resort are the Eight Outlying Temples, giant temples built by various emperors to receive foreign guests on diplomatic visits. The temples are not active, and probably never were they were more about public relations than spirituality. 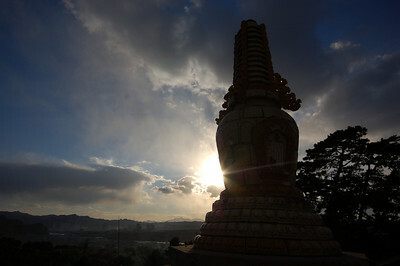 The largest of them is based on the Potala Palace in Lhasa. When you get closer to it you can see that most of the windows have been painted on, and apparently many of the buildings are cement blocks. On our first day in Chengde we dragged my dad around to four of the eight temples, three others are closed to the public and one is falling apart. We visited most of the buildings completely alone, it was cold but the sky was perfectly blue and the views were outstanding. 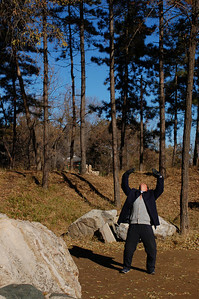 We devoted the next day in Chengde to the Mountain Resort. Compared to the Outlying Temples, this site is more about the grounds than the buildings. Peaceful lakes and forests with a few modest pavilions scattered throughout. We headed to the north end of the grounds where we had spotted tourists on the walls the day before getting great views of the Outlying Temples. As we approached the stairs leading to the walls, we noticed a sign informing us that as of Nov. 1st this section of the park was no longer open. We stood for a few seconds, first to figure out that it was Nov. 1st, secondly to decide whether or not we could access the walls from a different place. A woman approached us to tell us that we couldn't continue, Yann and I questioned her a bit, and my dad was off. 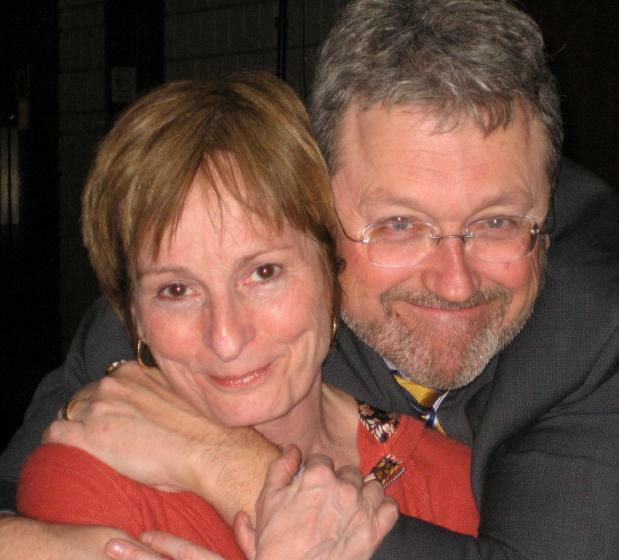 By the time we concluded that we should ignore the sign (and the woman) my dad was long gone. We joined him in the off-limits area and came up with a brilliant plan to evade authorities: pretend not to understand Chinese. 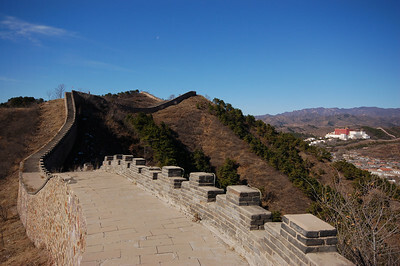 We spent the a perfect afternoon hiking along the walls, where we got great views of the Outlying Temples below, and through the back section of the park. 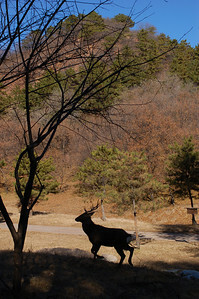 Alone, but for a few cranky security guards wondering what we were doing there, and herds of deer savouring their first day of freedom from the tourists. I'm ready to see a sleeper train pull into the ------ station with you in it.